BROWN New Marshall MAJOR 2 II On Ear Headphones HiFi Headset Wired. 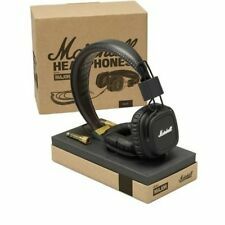 Marshall Major Headband Headphones - Black with Original Box, Pre-Owned. Condition is Used. Shipped with USPS Priority Mail. Marshall MAJOR II Bluetooth On-ear Headphones - Black. Condition is Used. Shipped with USPS Priority Mail. New in open box, has been tested for functionality. Marshall Major Headband Headphones - Pitch Black, Condition is Used. Shipped with USPS first class package. Shows very light signs of use, a few surface scratches barely noticeable. Condition is 9/10. Only been used about three times since purchasing new. Headphones will be cleaned and disinfected before shipping. Easily share your audio with a friend. Connectivity Technology: Bluetooth. Frequency response: 20 hz–20 kHz. Monitor Bluetooth features Custom tuned drivers for exceptional audio. Trending at $51.00eBay determines this price through a machine learned model of the product's sale prices within the last 90 days. 1 x headphones major iii bluetooth. 1 x micro usb cable for charging. Hall of 3.5 mm. Orders and connectivity. Autonomy: more than 30 hours of playback without wires. Marshall Major II Wired Black On-ear Headphones with Microphone. Earphones & Headphones. Grado iGrado On-ear Neckband Headphones. Integrated Mic & remote for usewith iPhone. Ear Cushions & Pads. They have no signs of use and sound great. 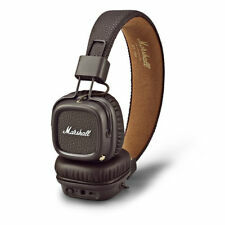 NEW Brown Marshall Major 2 Wired Headphone Remote Mic HIFI Headset. Condition is New. Shipped with USPS First Class Package. 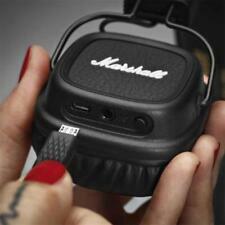 NEW Marshall Major II Bluetooth On-Ear Headphones Black [MR26-MM2]. Condition is New. Shipped with USPS Priority Mail. Major III is the next chapter in the revolutionary history of Marshall. While thicker loop wires with reinforced rubber dampers that contribute to the overall solid build quality. Major III Bluetooth features 40 mm dynamic drivers that are custom tuned for enhanced bass, smooth mids and clear highs. Original Black Marshall Major Leather Noise Cancelling Deep Bass Stereo Monitor DJ Hi-Fi Headphones Headset W/ Remote. Connectors: 3.5mm Stereo Mini Plug with 1/4" Adapter. 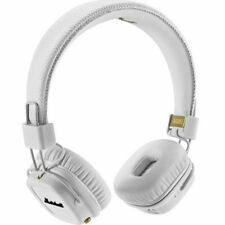 Product Details The adjustable, padded headband and soft on-ear cushions provide long-lasting comfort. New Bluetooth Headphones Marshall Major2 II Mic HIFI . New Bluetooth Headphones Marshall Major2 II Mic HIFI .. Condition is New. Shipped with USPS Priority Mail. Item is new in opened box, item has been tested. Works and functions as should. Item will be sold as is, no refunds or returns will be accepted. Trending at $32.00eBay determines this price through a machine learned model of the product's sale prices within the last 90 days. The Major’s already classic good looks upgrade to a more rounded construction and extra durable vinyl finish. With its newly constructed hinges and headband design, the Major II fits better than ever. Seamlessly Connect to your listening device with the latest in Bluetooth® aptX Technology and listen to 30 hours of music. 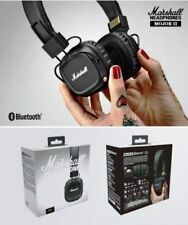 MARSHALL MAJOR 2 BLUETOOTH HEADPHONES. Marshall part number is. These are 100% authentic Marshall Audio System. We do everything start to finish. 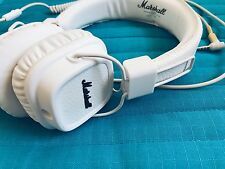 REDUCED Marshall Major II Wireless Headphones Leather XBass 30+ Playtime NEW!